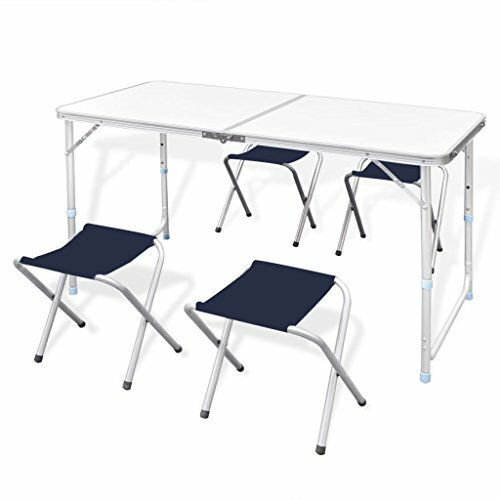 This foldable camping table set consists of 1 foldable table and 4 foldable stools. Thanks to the practical carrying handle and the adjustable height of the table, this set is perfect for uses in kitchens, on patios, in gardens, or on picnics and camping trips. The camping table set is light in weight. The carrying handle makes it very easy to bring the table with you when going out to have a picnic or camping trip. The table height can be adjusted to 21.7", 24.4", and 27.6". Thanks to the sturdy structure, this camping table has a high load capacity up to 66.13-110.23 lb. Thanks to the metal frame and the robust MDF tabletop, the set is highly stable and durable. The included stools are made of durable steel tubing and high-quality oxford fabric with PVC coating. The table and the stools are both foldable for easy transport and storage. Delivery includes 1 table and 4 stools. 6' Folding Table Portable Plastic Indoor Outdoor Picnic Party Dining Camp Tables for family reunions, picnics, camping trips buffets or barbecues.